I posted a couple of photos from this location taken a bit over a week ago now. 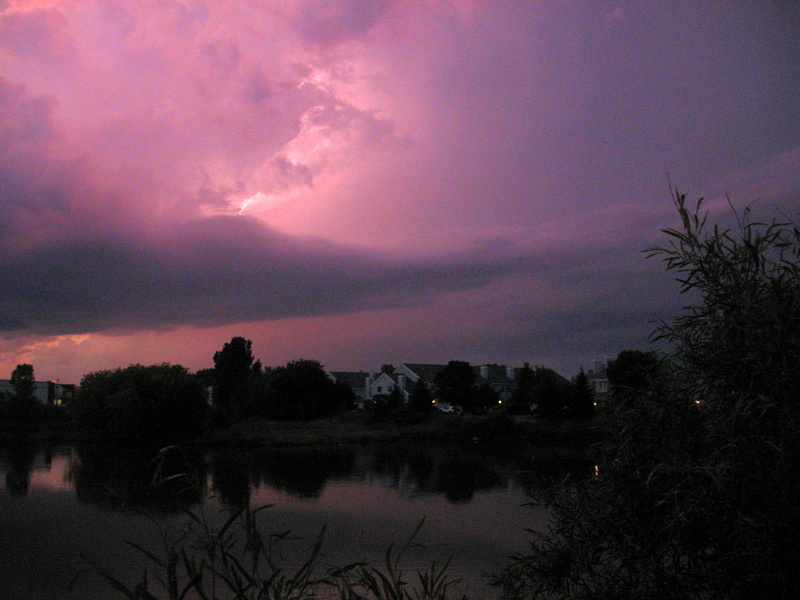 The sky was an odd pinkish purple this evening while a storm was passing through to the north. I really liked the sky in this one and how it reflected so well on to the pond below. This was just a few minutes later from the same location as the sun set a bit more. A view of the Hastings River Bridge with the Milwaukee Rail Road Bridge in the distance looking east. 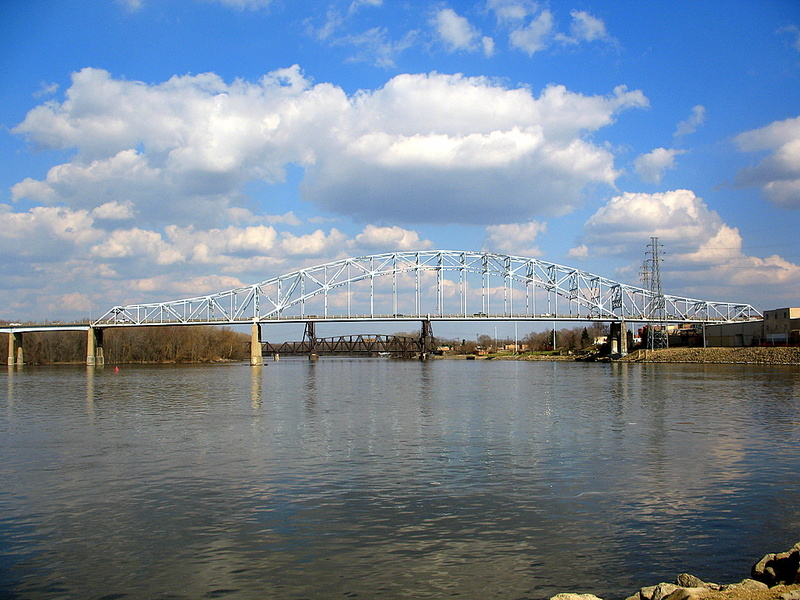 The bridge crosses the Mississippi River, into and out of downtown Hastings. Do you see them bikers in the photo that are in the photo on the walking path of the bridge? They almost ran me over!! 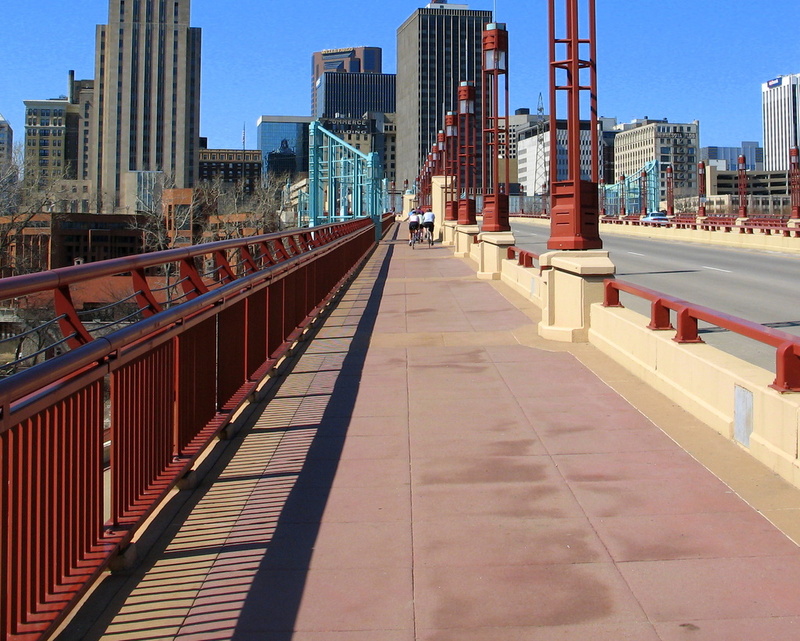 There I was walking peacefully on the Freedom Bridge heading into downtown St Paul, when I hear this "On your right" yell from the leader of the bike gang. I had to step, I mean "jump" out of the way to save myself from a serious injury of a fast moving 10 speed. I swear as they passed, I heard one of them say to me, "hi" and nodded his head up and down. I was trembling in fear. 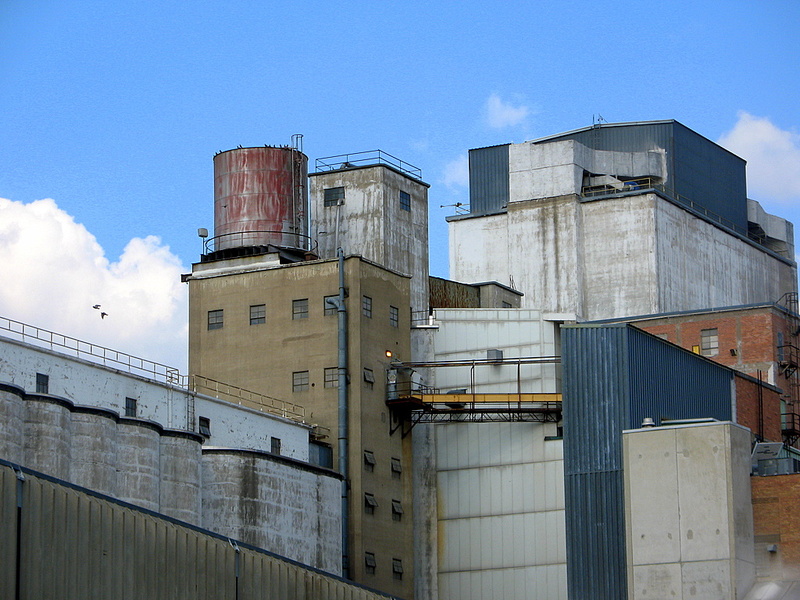 Back in early spring, [you can see a few buds on the trees to the right] we took a family walk down by the Hastings Flour Mill. They have a great trail system in place. 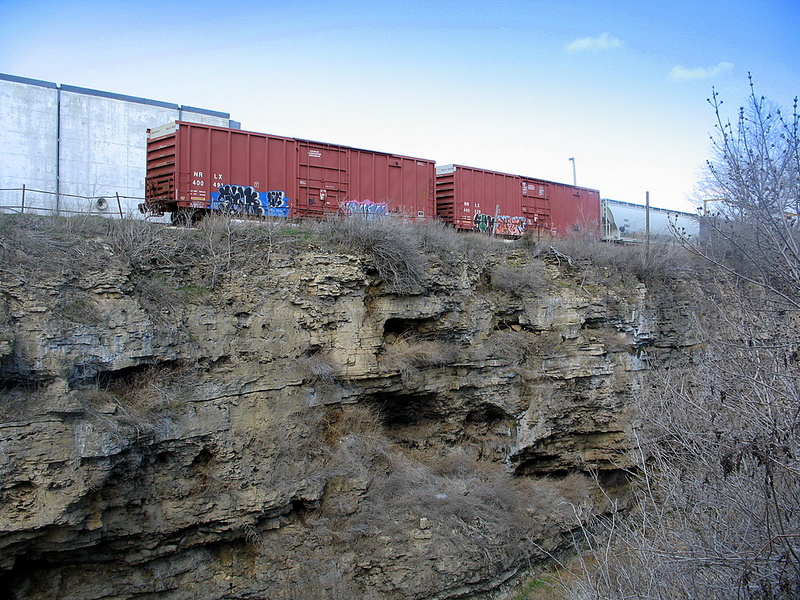 This train car was just down from the mill and across the Vermillion River. That car is right on the edge of the cliff. The cliff is falling apart below, huge chucks have fallen out. Yet there it sits, all comfy ad could be. 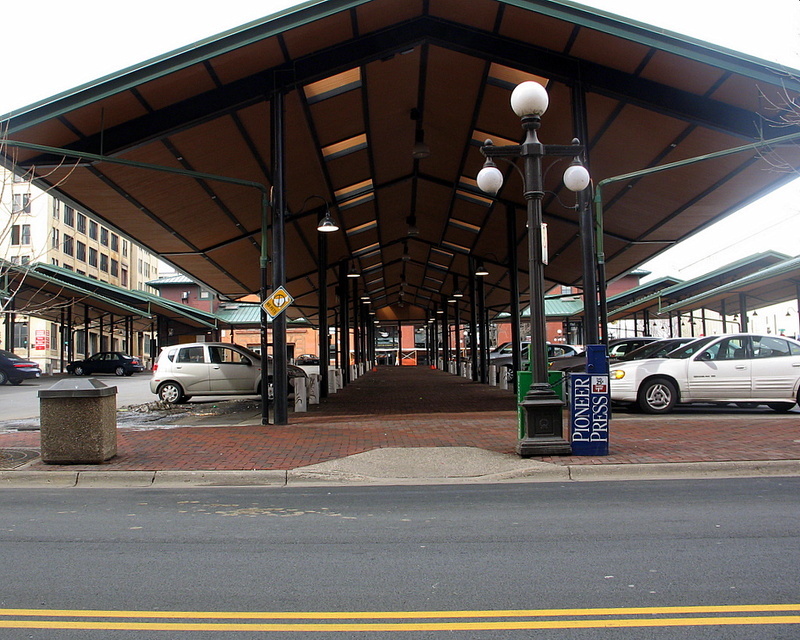 Site of the Farmers Market in downtown St Paul. This was taken in the early spring, on a Sunday morning, before the market started for the season. There it was on this hot and sultry day. 90 plus degree temperatures, sweltering sun, hardly a cloud in the sky. 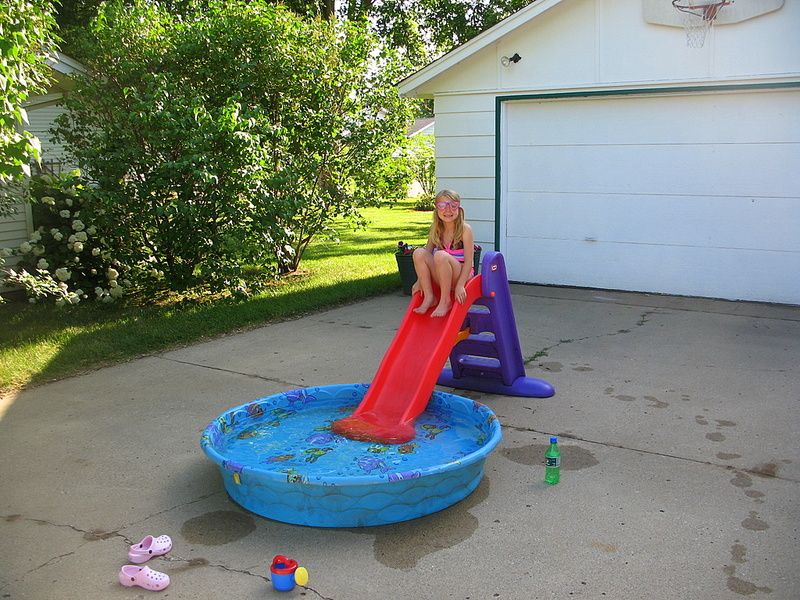 Here I am putting a plastic slide into a small child's swimming pool full of water. Then this thought went through my head....This is like one of them emails you open up, the subject reads "redneck photos". You look at the photos of the most bizarre situations and just shake your head and laugh at the fools in the photos. I look to my wife and said something along the lines of...."I've just made a redneck water slide, I've got to go get my camera". It was my daughters idea to wear the goggles sliding into the pool of water. Now the best part....her hair never got wet! Please do not laugh at us too much. I awoke this morning, looked out my windows....not my bedroom window mind you as that looks out into my driveway....and I saw a sign, hammered into the ground. Obviously I had to investigate at this new lawn ornament. The sign read that there was no parking due to a temporary police order. Confusion set in at this point. Why confusion you're asking? The sign is right next to a fire hydrant. 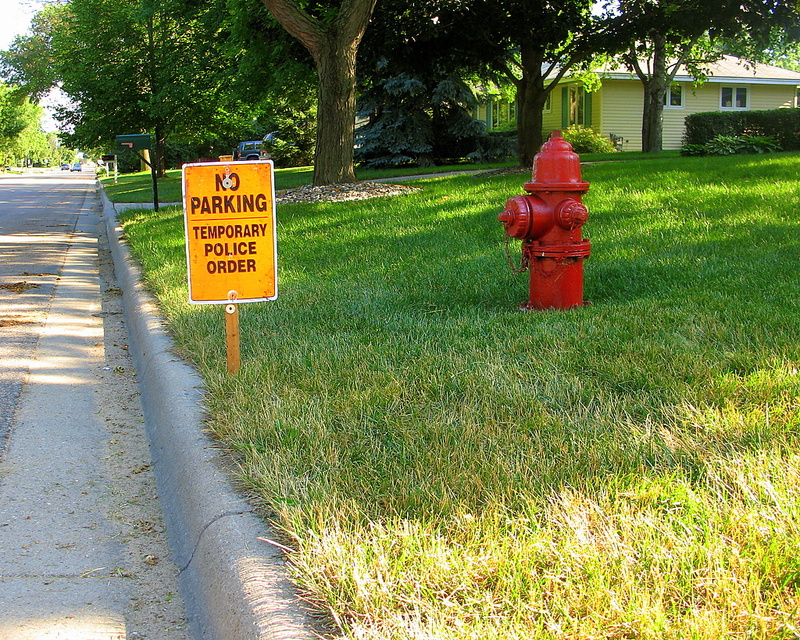 There is no parking in front of a fire hydrant already enforced because of a city law. Does this mean when the sign is gone, I can now safely park my vehicle in front of the fire hydrant? I think not. I found humor in this sign and it's placement location and had to point this out to you all. In reality, there were several signs placed along my street as the city will be soon repaving the street with a layer of spray tar and rock. Someone wasn't thinking when they placed the sign in my lawn. Another photo from the storm that rolled through the Twin Cities a couple of days ago. This was a storm that produced a lot of large sized hail, anywhere from nickel size to softball sized hail. Thankfully, the hail damage was no where to be found in my city. However, the cities north and south received hail. As I was taking photos of the passing storm, I managed to capture a bit of lightning in one shot. It's nothing spectacular, but I will count this as my first lightning shot I've ever taken. I took this photo about an hour before yesterdays massive thunderstorm cloud photo. I was just at the start of my journey, heading to Woodbury for my errands. 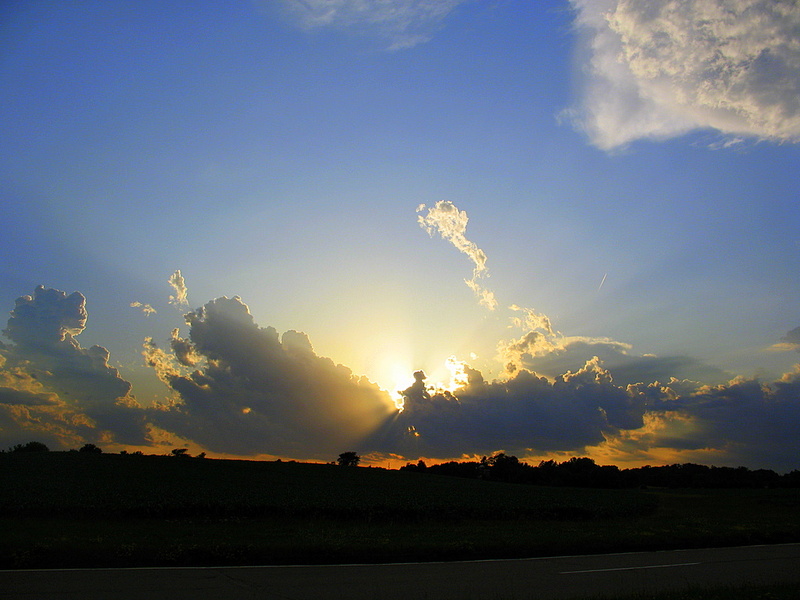 I could see the sun shining partly through the the clouds and what a site it was. The problem was, there were houses, trees and many other obstructions in the way for a clean shot of the clouds. The clouds were moving fast and my chance to get a great shot that I was seeing was only available for a short time. I was watching the sun and the clouds movement and it looked like I was going to get the sun behind the sprout of clouds in the photo, but I had to move fast. I knew up ahead was a corn field that may give me a chance at a great photo opportunity. I hit the gas and sped on my way to the open area and just made it in time as the cloud/sun pattern changed very rapidly as the approaching storm rolled around the Twin Cities. If you want to see the clouds about an hour later, scroll down to yesterday's photo. 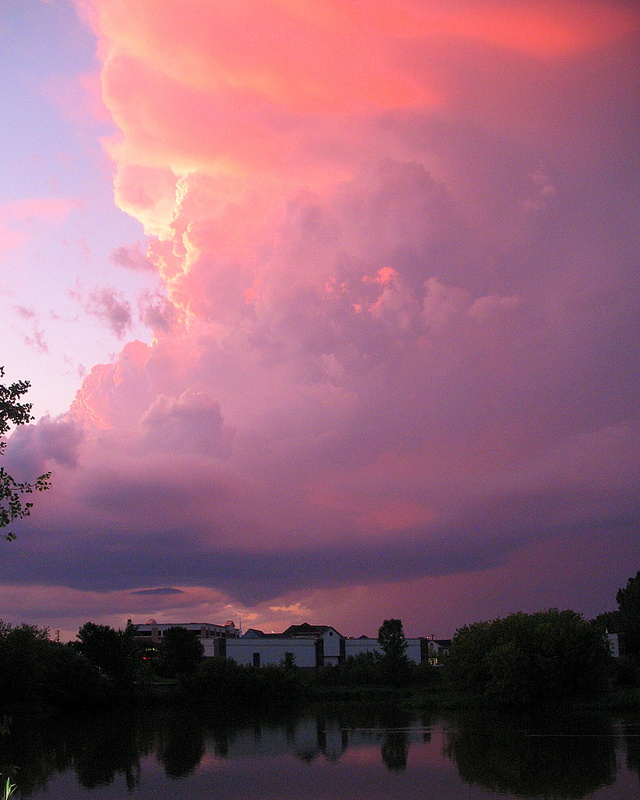 I'm not sure if any of the other local daily photo photographers were out and about Wednesday evening with the threat of severe thunderstorms were rolling to the north and south of the Twin Cities, the clouds were a sight of beauty. Massive height on the clouds, the sun setting low, pink sky everywhere. I was returning home from running a couple of errands. I watched the sky over the past couple of hours, just in awe as they changed and moved across the sky. Then an idea struck me....I need to find a body of water and get some type of reflection shot of the clouds on water. Problem was, there wasn't anything around. I'm driving on a main road in Woodbury. Reflections are not going to happen. Not a problem, I can get a great shot of the clouds at the very least. Then I saw it, a small man made pond next to a bank! Yes! Well, sort of. The way the bank, the pond, small small pond and the clouds all lined up, I was only able to get the business buildings and trees as reflection, I needed a larger lake, but the sky is oh so beautiful. At least that's what we've always called this stretch of rocks as we leave Jordan Lake and make our way up to Ima Lake. It's the most unique stretch of any part of the BWCA that I've personally seen. There is a long channel and one side of the channel is made up of rock that looks as it's been painted in some sort of prehistoric bachelor bedroom cave. It's really a site to see. Some of the rock walls have collapsed over the years, but they all have this similar look to them. If you look closely, there are diagonal lines grooved into the rock. We've always assumed when the glaciers of the ice age was here, it made the cuts in the rock. I'm not sure how else they would have gotten the look that they have, but I've never been able to confirm this. It's always been our story as we pass through this channel. 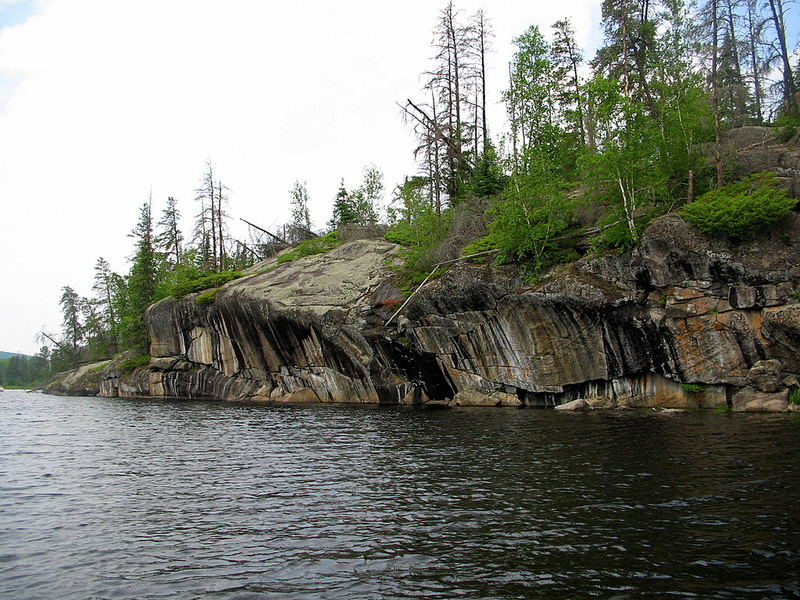 This photo is one of my favorite places to visit in the Boundary Waters Canoe Area. We generally make our way through the same areas each year and will visit certain areas every couple of years. Since I had brought my son for the first time, I had to bring him here and point out a few things you may not notice or cannot see because it is behind where I am taking the photo from. If you look close, there are the remains of trees sticking out of the water. This body of water, at some point was a thriving part of the forest, but was altered by natures engineers, beavers. Behind me where I am standing for the photo is the bulk of the beaver dam that they built. I suspect there is more to it in a couple other areas, but I've never been able to go further than this point, there just isn't away into it that is manageable. I made a visit to the BWCA this past week. 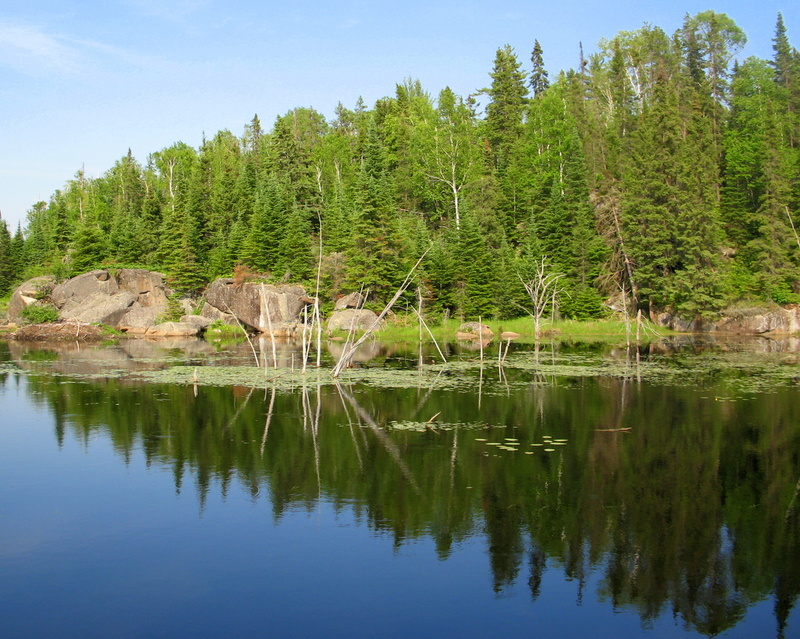 For those of you not familiar with the BWCA, it stands for Boundary Waters Canoe Area. This was my eighth or ninth trip to the BWCA and this year was the first time I brought my son with us on our trip. He will be turning nine years old in a couple of months. I thought perhaps it was a bit too early to bring him up there as this type of camping trip isn't for everyone. There is no electricity, no phone service, no restaurants, nothing except for what we bring into the BWCA for a weeks trip. Portaging canoes, a food pack, our personal packs. Throw in the wilderness, bears, moose, raccoons, wolves, not to mention the weather and what it can bring. Could an eight year old handle it? He survived, I survived and our bonding time together was well worth the trip. 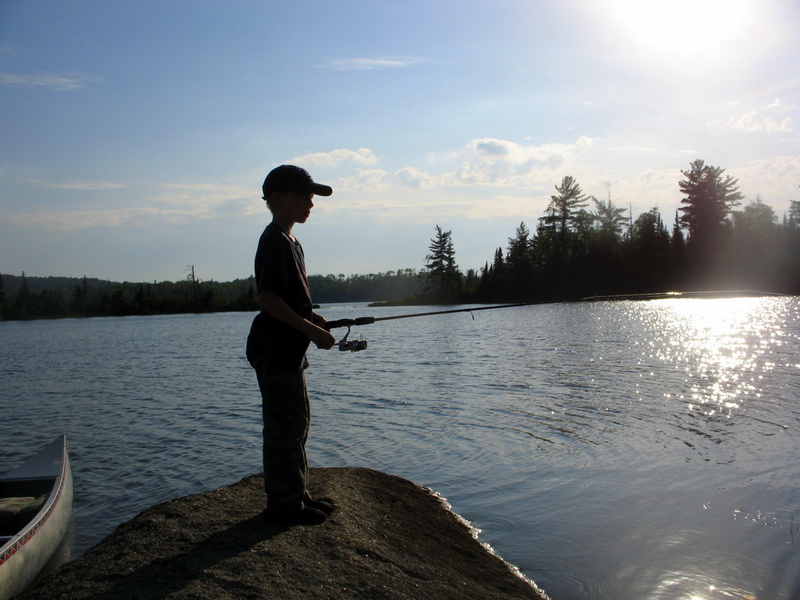 I felt it was fitting for today's photo to have a photo of my son fishing, or at least his silhouette. What a strange weather pattern we had. While the rest of the world is in a political scare of global warming, Cottage Grove had 13 inches of fresh snow on the ground when I awoke! All of the cities around Cottage Grove received a couple inches of rain. There was only snow in our city in the entire state of Minnesota. 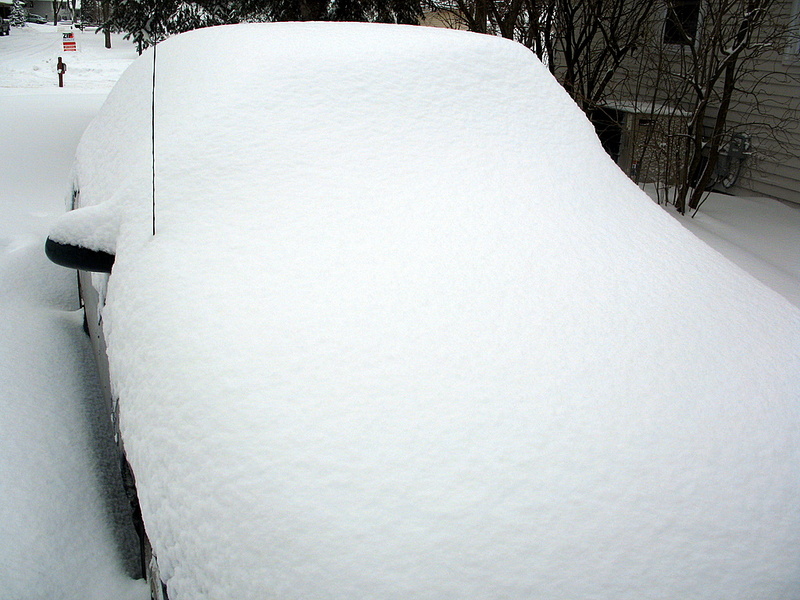 Scientist are puzzled, Al Gore is writing a new movie script....Wait a minute, this was from the end of winter a few months ago of my car buried in snow. Carry on about your day, my bad. Excluding this next sentence: Number of weeks Twin Cities Daily Photo has not mentioned a word about Paris Hilton: 84 straight weeks! Despite all of the sections you see in the photo, they all connect in some shape or manner. What a crazy engineered hodge podge of buildings that do not match what so ever. This is the Hastings Flour Mill that I have posted on back in January with a broader view. One thing I never noticed before was the faded red water tower. When did that get up there and why had I never noticed it before. I've visited the site many times, but there it was, something new to my eyes. I've always enjoyed seeing unique water towers and this was a delight to photograph. Do You See One Building Or Two? My first glance at this photo today, I saw one building with great detail, lines and tan brickwork. Then it looks like there was an addition to that building. It has tan brickwork, square windows shaped around the original building, and them made it blend together in sort of an old versus new mesh. A bit odd in the contrasts between the two, but overall it works together. Now look at the window from the top down, third row on the right. There is a top portion of a window sticking out of the roof. Now I see it, those are two buildings, two separate buildings, not one. hahaha! The build with the square windows is a Qwest building, I'm not sure what the building in the front is. 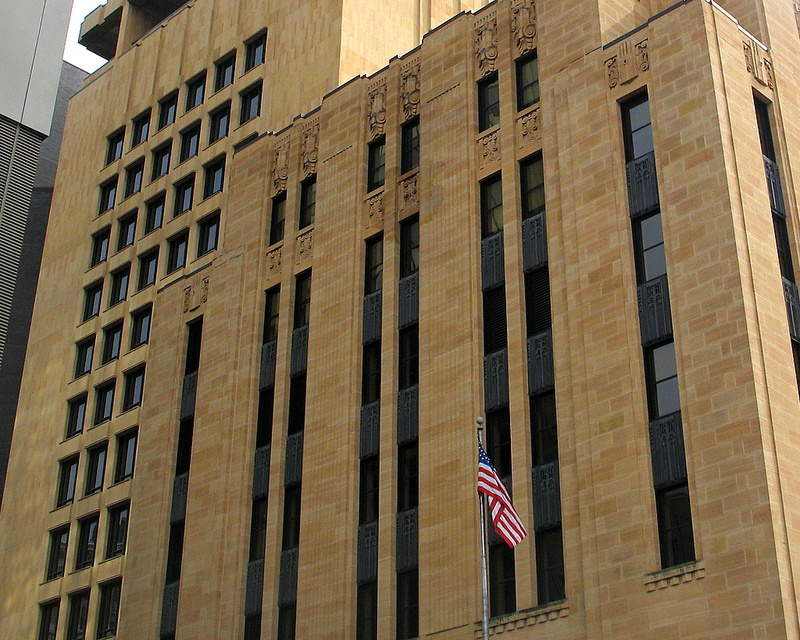 Both are located in downtown St Paul around Rice Park. After my frustration on changing my template last Sunday, I managed to edit a "classic" blogger template to nearly the exact template I was going for under the new blogger layouts. I'm using the 'rounders' template with an extra sidebar added. The one I found had a side bar on the left and right. I modified them both to the right and did my customization I preferred. I still need to do some minor tweaking, but you shouldn't notice much if at all behind the scenes. 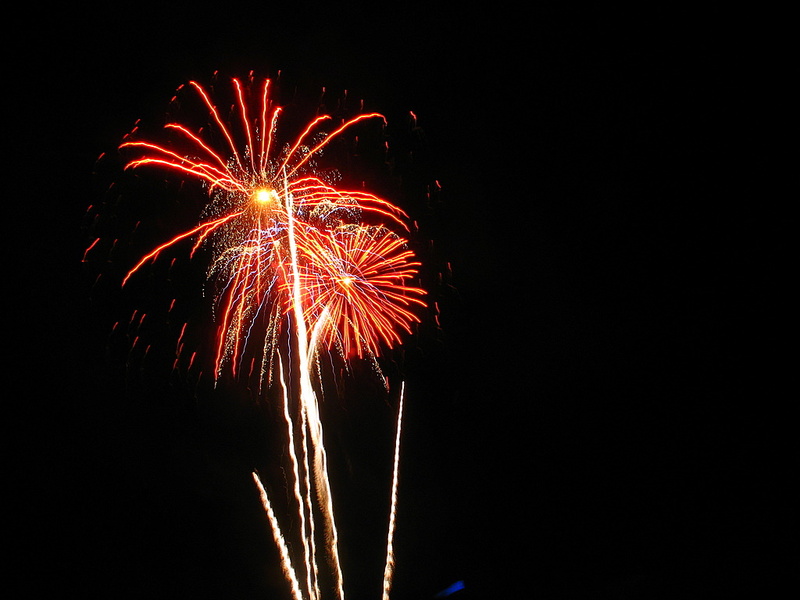 I felt with the new layout party, it was only fitting to post a fireworks photo I took last summer at the Minnesota State Fair. I was using my knee as a tripod for the shot. There is a slight shake, but my knee tripod turned out okay. I can't get the Kool and the Gang song out of my head....everyone around the world, come on....it's a celebration....celebrate good times....come on! Woo Hoo! 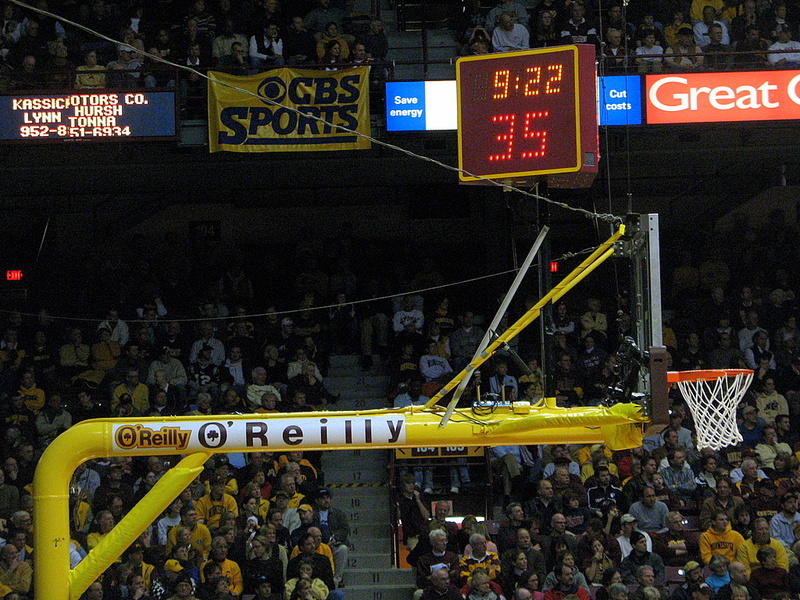 From a Minnesota Gopher basketball game earlier in 2007. Kinda of different looking at all the people with their heads turned towards the action, but you can only see the crowd. As the title says, this photo is of the south side of downtown St Paul while I'm standing in the West Side neighborhood. Naturally, the West Side neighborhood is south of downtown St Paul. If you go east of downtown, you're in the East Side neighborhood. There is also a city named 'North St Paul', located north of St Paul. There is a city named 'West St Paul', that ironically is located south of the West Side neighborhood. However, south of 'West St Paul' is....drum roll....'South St Paul'. I'm not sure who created the names of the areas/cities south of downtown St Paul, but their compass was not pointing in a northerly direction. I know what you're wondering, what is the city directly west of St Paul? Naturally its, Minneapolis! This was a bit confusing writing this, I can only imagine you as the reader reading it and what you are thinking. Haha! Bastia, France - must see! So I spent the past few nights working on a new template for TwinCitiesDailyPhoto.com only to find out, that the new blogger templates are NOT supported on "non-blogspot" servers. My countdown was to unveil my new template for TCDP, but that will not be happening today. Disappointment in finding this out tonight on my launch date is an understatement. To bloggers credit, the new template layouts were very easy to work with and I'd recommend them to anyone without a custom domain name like I have. They've made it really simple to work with if your not familiar with .HTML and the coding. But to not have it available to a custom domain website name is [enter your fowl word of choice here]. Back to the drawing board I go. So I'll stick with my boring blogger template that I currently have for the moment. I have no current choice as of this writing. For today's Twin Cities Daily Photo I'm posting the TCDP logo I created for my new web design. I will at least show you that part until I create a new custom template in the OLD blogger format. 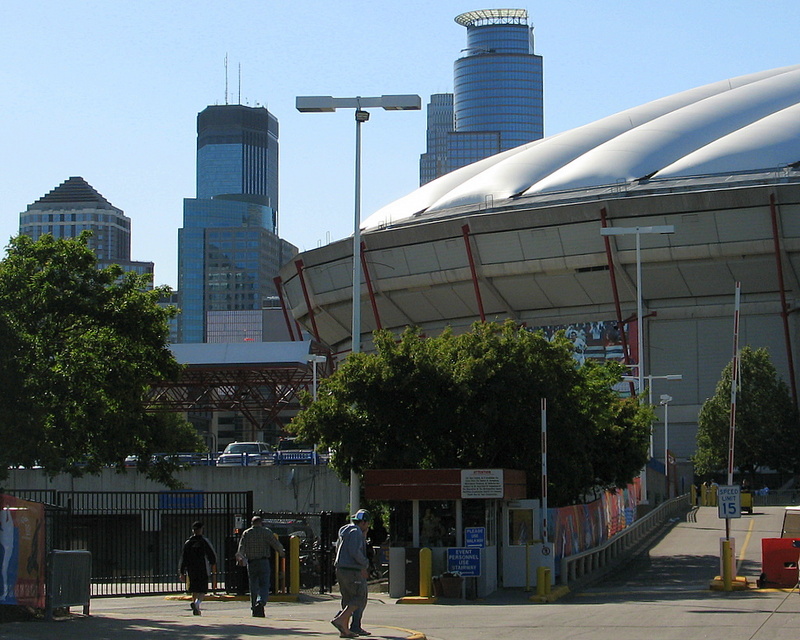 I took the family to the Metrodome in downtown Minneapolis last weekend to see the Minnesota Twins play some baseball versus Toronto Blue Jays and took this photo on my way into the stadium. The Twins lost in the 13 inning, but the game was rather exciting at the end of it. They were losing 7-2 in the 7th inning and came back to tie the game in the bottom of the 9th. They were down by 1 run in the 11th, came back to tie yet again in the bottom of the 9th. Ultimately they lost in the 13th inning by not coming back a third time to tie or take the lead. Today is theme day for the City Daily Photo community. This months theme is to take a photo of your city from your bedroom window. Very easy photo to take, but not much of a view unfortunately. I'm actually doing some construction on my bedroom. 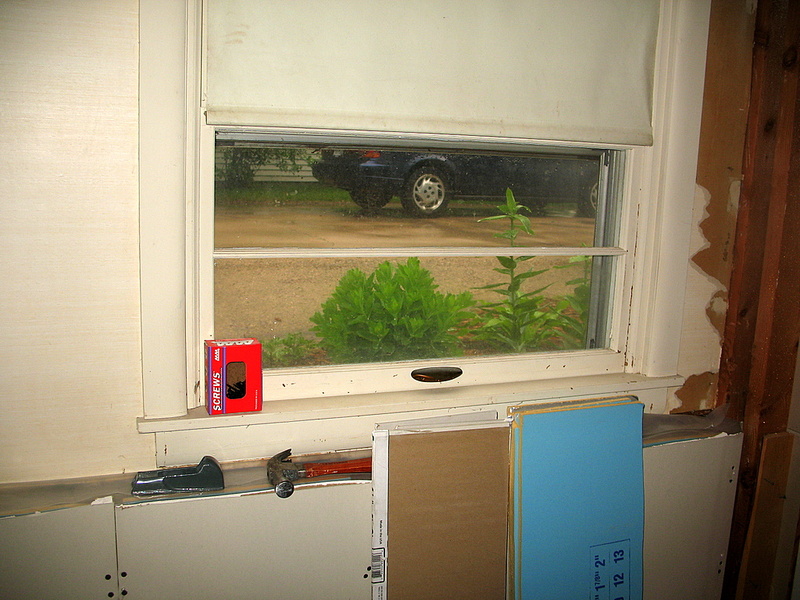 I removed all of the woodgrain paneling and replaced it with sheet rock. Outside my window is my driveway to the garage. There was a small strip of grass between the house and the driveway that we've made into a flower bed. So we have a ground level flower bed outside our window!